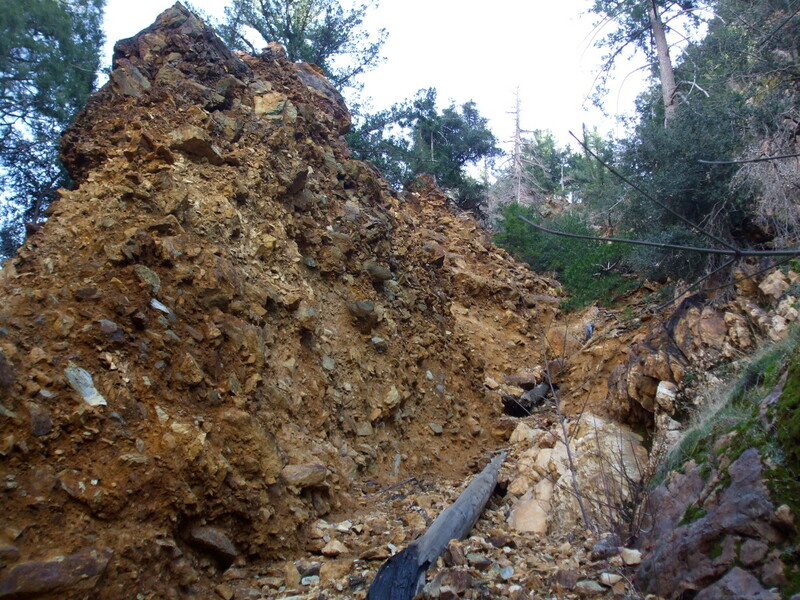 In my opinion, Cascade Canyon is one of the premier mineral collecting localities in the United States. Not only does it boast spectacular corundum crystals, but it also is one of only three places in the United States where one can find lapis lazuli. 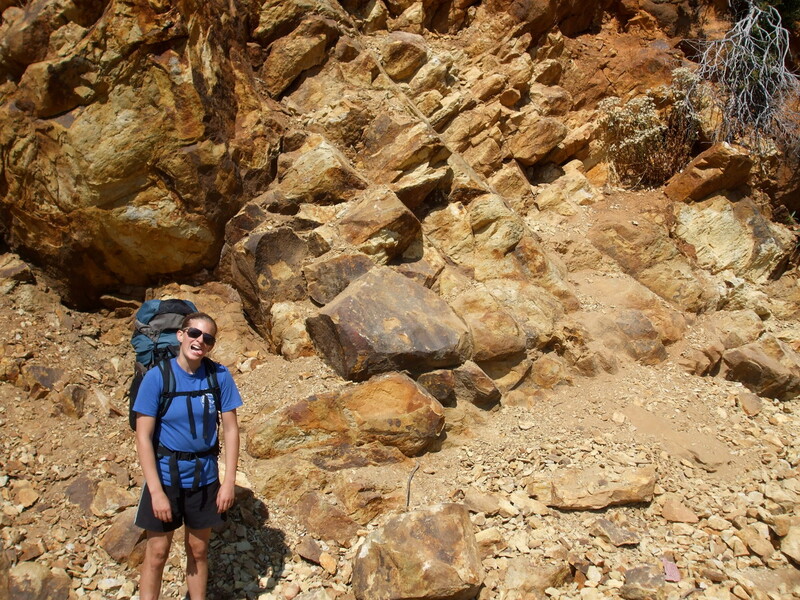 The rocks of Cascade Canyon consist of complexly deformed sedimentary rocks that have been contact metamorphosed by small granitic intrusions. The sedimentary rocks are likely originally Paleozoic in age (between about 550 and 250 million years old), and the granitic intrusions are Cretaceous in age. 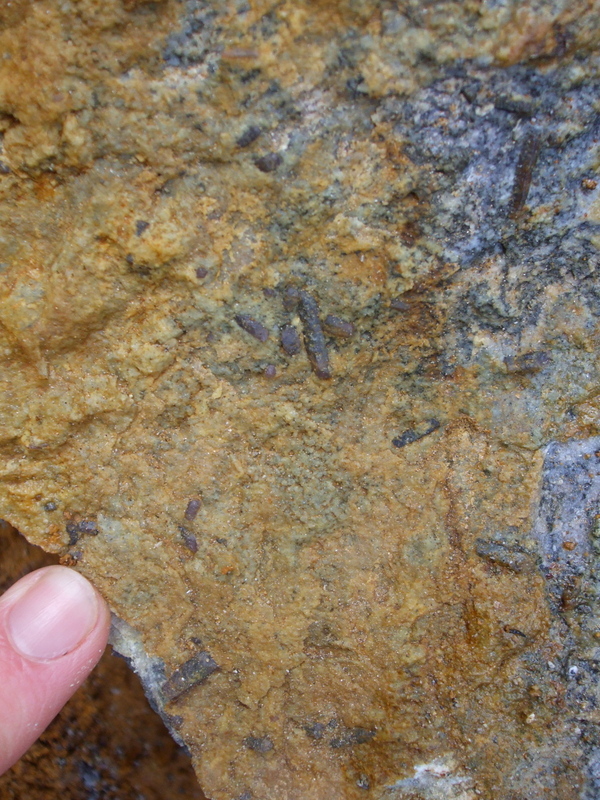 (Jade Star Lackey at Pomona College has dated some of the leucogranitic intrusions at 85 Ma, although there also appears to be a slightly younger metamorphic overprint at about 75 Ma.) 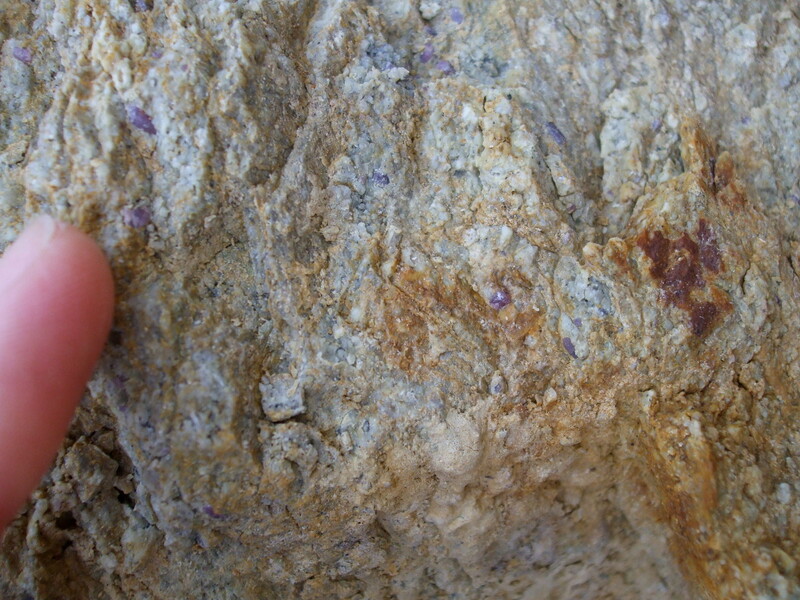 The contact metamorphic conditions and the composition of the sedimentary protolith (the original, pre-metamorphic sedimentary rocks) were such that an unusual mineral assemblage of corundum, sillimanite, quartz, diopside, tremolite, fuchsite, and lapis lazuli (a complicated solid-solution mineral of the sodalite group, which includes sodalite and lazurite) developed in these rocks. 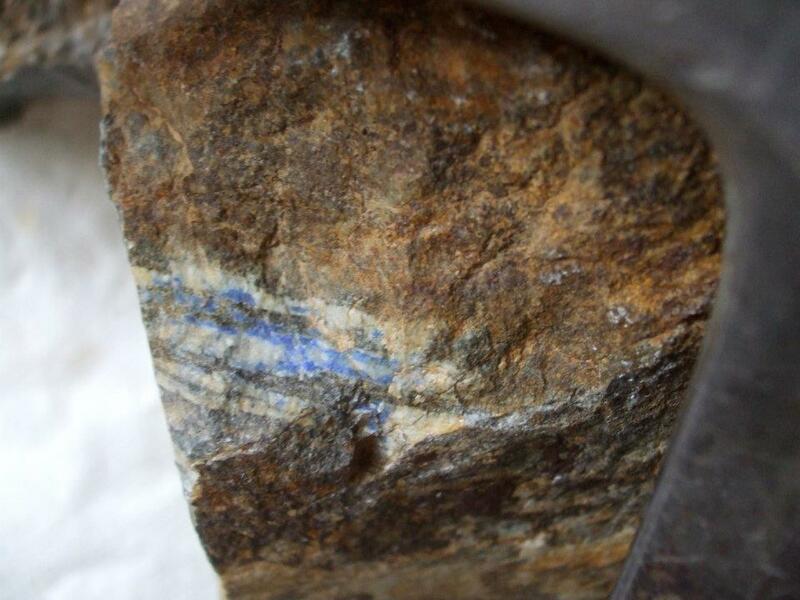 Rare lapis lazuli is found in the upper reaches of Cascade Canyon. 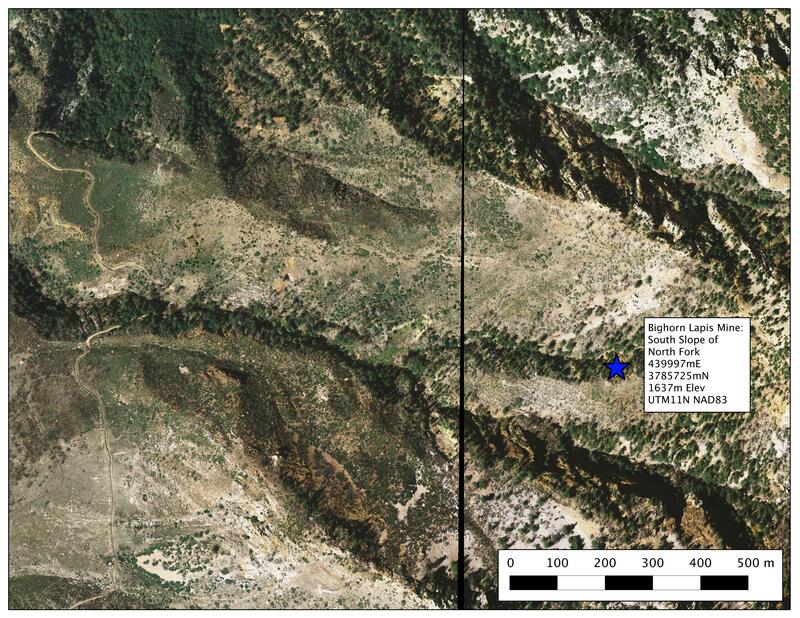 The deposits seem to be restricted to the ridge that divides the north and south forks of the canyon. The Bighorn Mine, which operated for several years in the early 1980s until this area was withdrawn from mining, is located on the south side of the north fork. 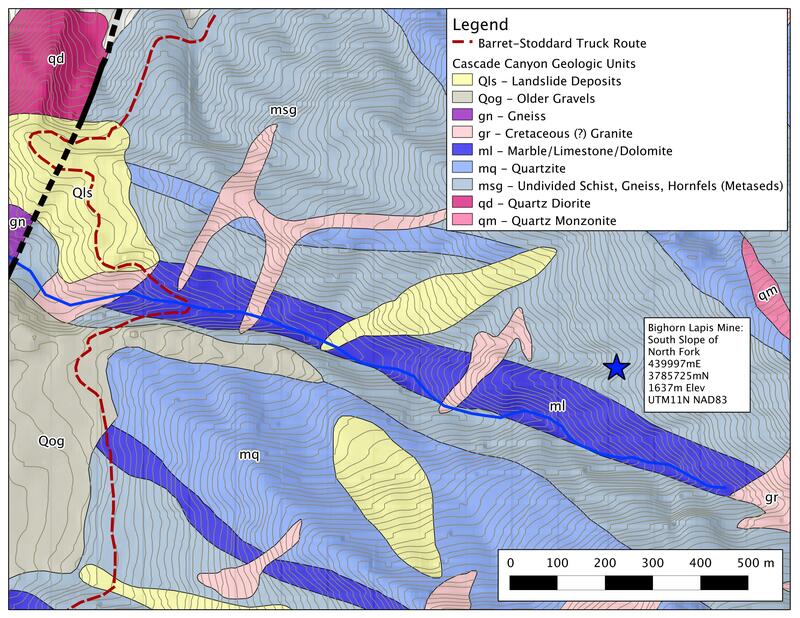 The first set of coordinates above gives the location of the mine. 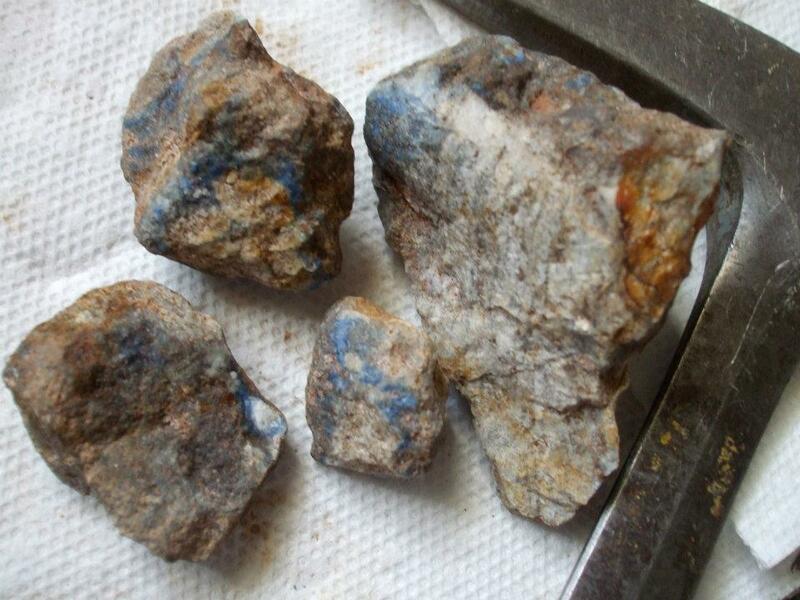 The lapis is most often found here as discontinuous blue veinlets with silver pyrite in a banded metasedimentary rock. 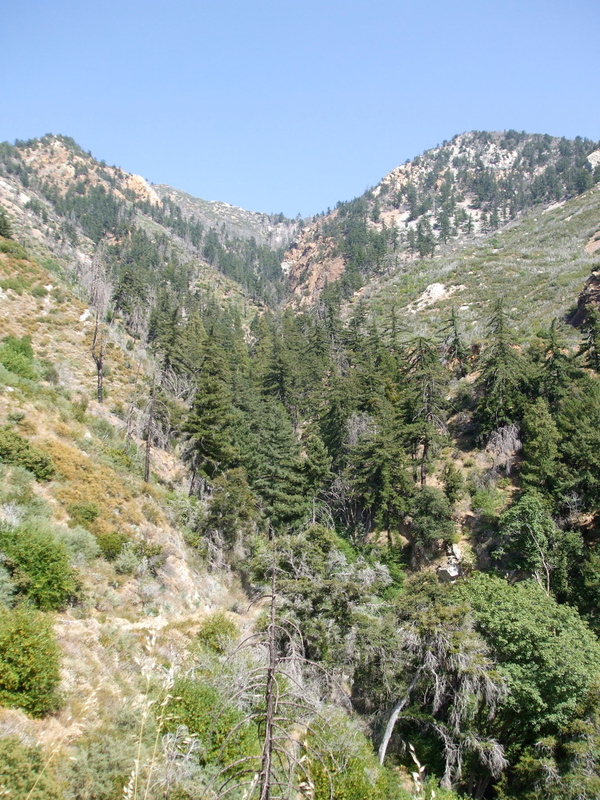 To get to Cascade Canyon, I recommend starting from the parking area at the junction of the Barrett-Stoddard Truck Route and Mount Baldy Road (you will need an Angeles National Forest Adventure Pass, or equivalent). From here, you can walk along the Barrett-Stoddard Truck Route through the small community in Barrett Canyon. Beyond the homes, you will pass around a locked Forest Service gate. (Non-motorized traffic only is allowed past here. While you can drive to the gate, there isn't much space to park or even turn around.) 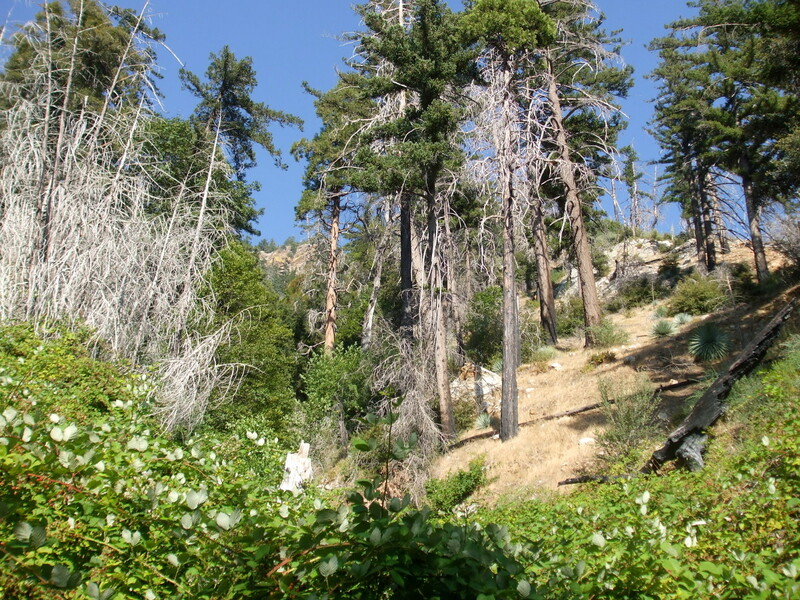 From here, continue walking along the road until you get to Cascade Canyon. 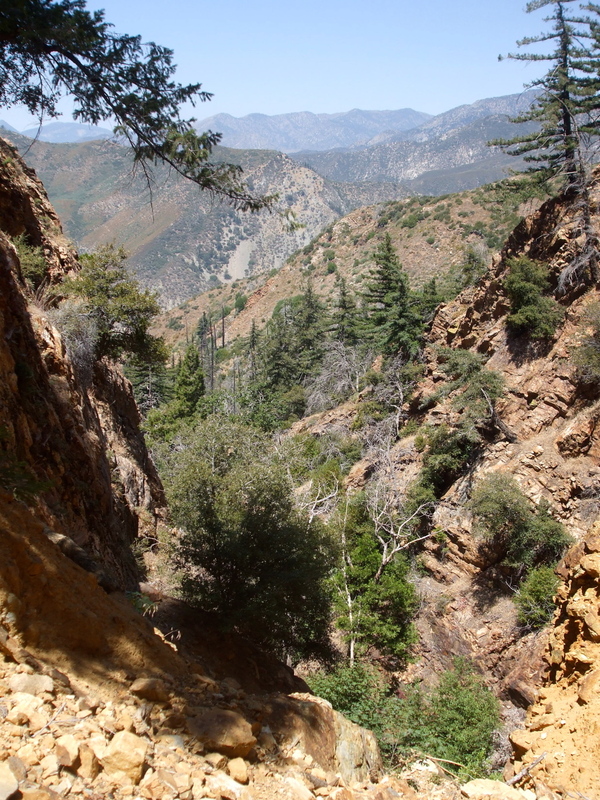 The hike up the canyon itself can be rather treacherous. There is occasionally a semblance of a trail, but for the most part the hike is an extreme cross-country bushwhack in unstable, dynamic terrane. A true adventure outing. Lapis Lazuli from San Bernardino County, California, A.F. Rogers, American Mineralogist, 1938. 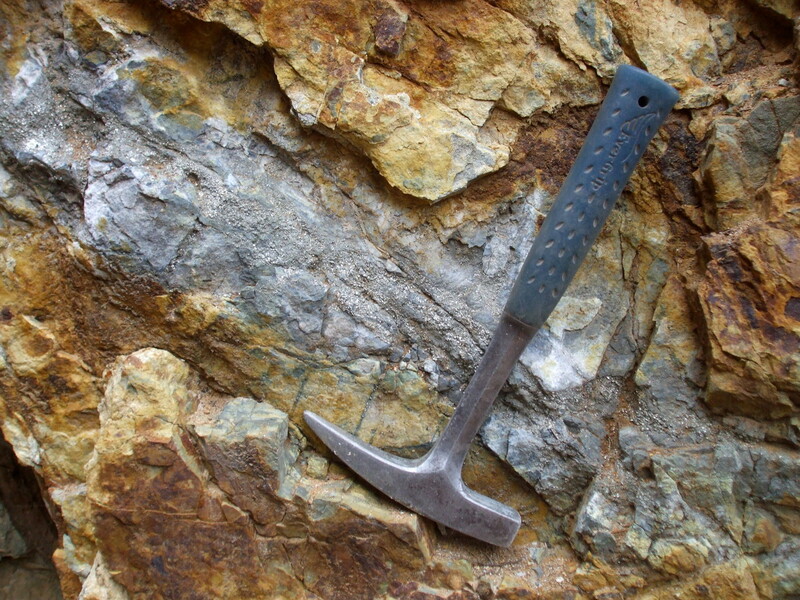 Zr-in-Rutile Thermometry of a Ruby-Bearing Metamorphic Rock, Cascade Canyon, San Bernardino County, CA, H.V. 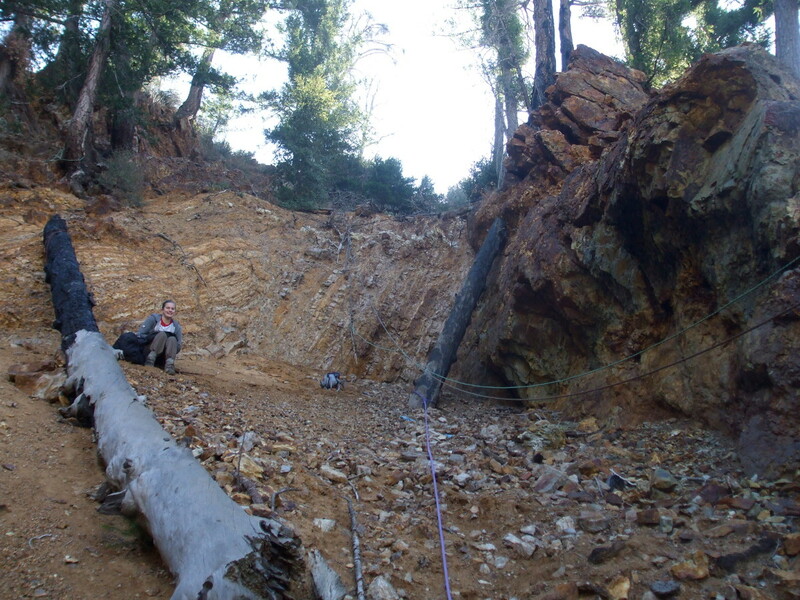 Shepherd et al., Geological Society of America Abstracts with Programs, 2010. Where to Find Rocks, Cascade Canyon "Rubies"